This Franklite Taffeta 3 light crystal chandelier in polished chrome with square section arms, crystal column and crystal drops is magnificent, stylish and elegant. Featuring mirror chrome 12cm ceiling mount, chain suspension and crystal clad column, with three graceful curved arms fitted with candle style lights. The arms feature heavy faceted crystal glass drops, chrome candle tubes and hanging strings of crystal buttons and faceted balls for added sparkle. An inspired contemporary design that’s perfect for installation in a small luxurious bedroom, living room, hallway or dining room. Height adjustable at the time of installation only. There are matching fittings in the Taffeta crystal lighting range, please scroll down the page to view. 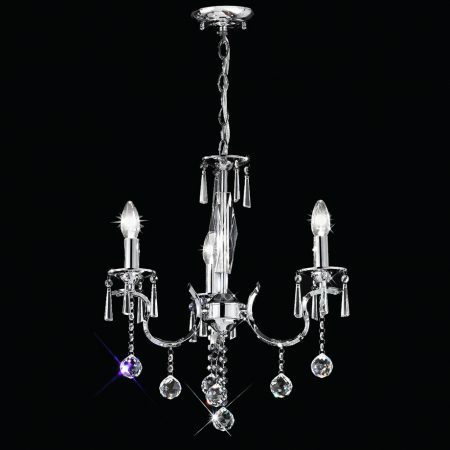 This luxurious fitting is supplied by Franklite Lighting who have been one of the pioneers in the design, manufacture and distribution of high quality lighting such as the Taffeta 3 light crystal chandelier in polished chrome with square section arms, crystal column and crystal drops you see here.